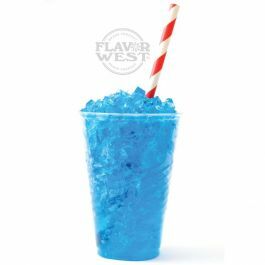 Blue Ice flavor has an icy freshness of menthol and blueberries for a delicious cool taste. Type: Blue Ice Water Soluble Flavoring. Ingredients: Natural and Artificial Flavoring, Propylene Glycol. USP Kosher Grade Flavoring. Usage Rate: 15-20% for E-use. Flavor suitability: drinks and beverages, candies and more. Specific Gravity: 1.02 No Refunds on Flavoring. thought this was going to taste like a blue slushee but was overwhelmed with menthol coolness. would recommend using this concentrate as an additive rather than the full flavour. Blueberry Menthol/Koolada with a hint of something sweet. I expected this to be a Blue slushy/icee flavor. Menthol is the dominant flavor, maybe I got a weird batch. Would recommend adding more blueberry, maybe some raspberry. Lemonade is a fantastic mixer with this.